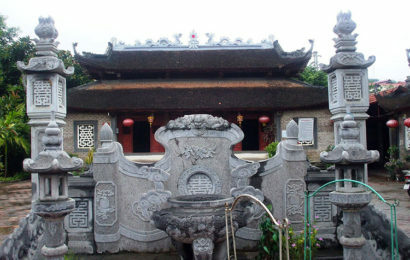 Khai Đinh Tomb (Vietnamese: Lăng Khải Định), officially Ung Mausoleum (Ứng lăng), is located in Chau Chu mountain near Hue in Vietnam. 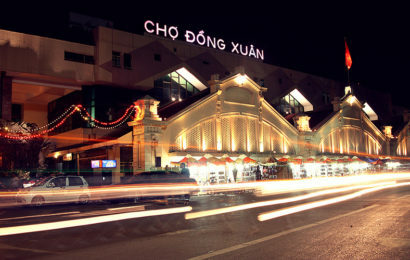 It was built for Khai Đinh, the twelfth Emperor of the Nguyễn dynasty. 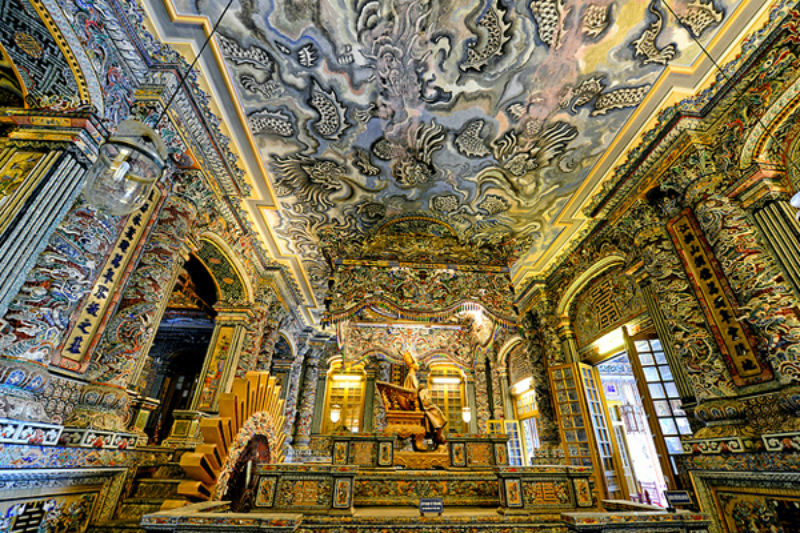 It is located on a steep hill outside of the capital city of Hue. Khai Dinh tomb is the most costly and recent compared with other Nguyen royal tombs. After his ascendancy to throne in 1916, Emperor Khai Dinh chose the slope of Chau Chu (Chau E) Mountain, which is 10km from Hue center, to construct his “home in the other world” – according to Oriental belief. 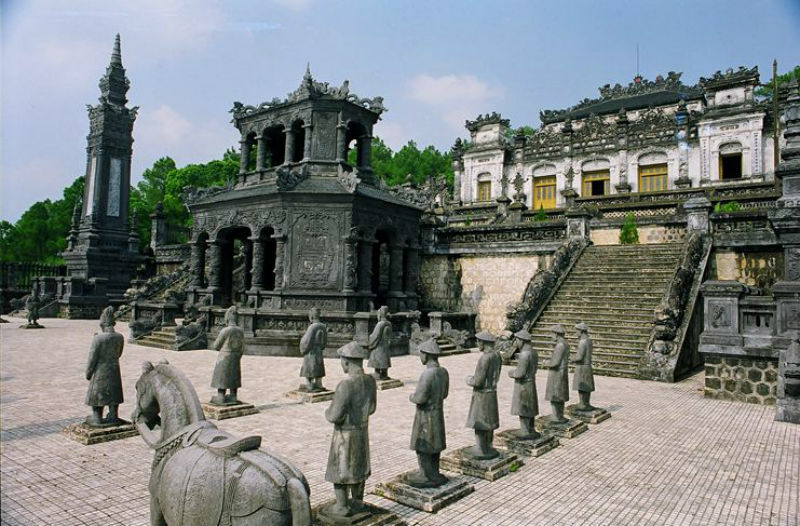 It was started building in 1920 and completed 11 years later, by his successor – Emperor Bao Dai. In order to complete the tomb, the rulers had to raise national tax to 30%. By then Vietnam sovereignty was lost to French invaders and Western culture was prevailing all over the country. 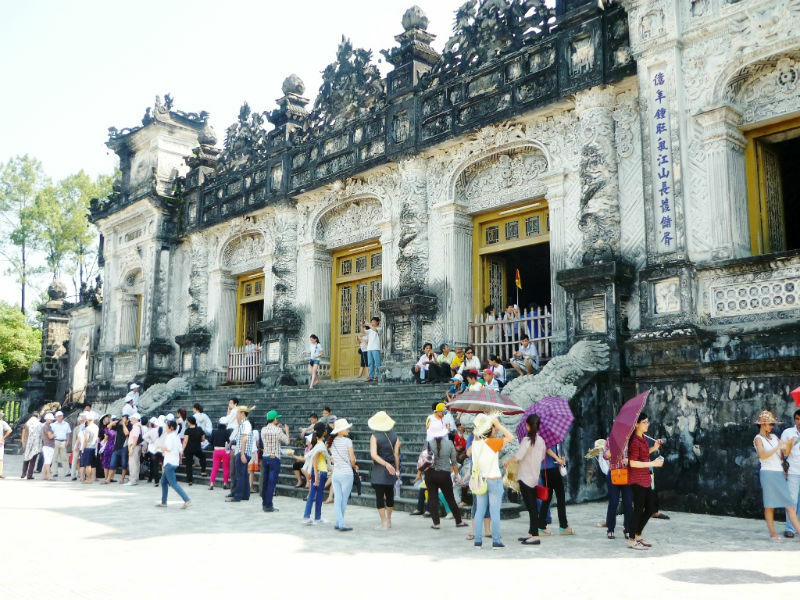 Consequently Khai Dinh tomb is the result of the intermingling of Oriental and Occidental, Roman and Gothic style, Hindu and Buddhist style, as well as ancient and modern features. It’s also known as Ung Lang. At first, the main building brings about a strong Western feel, however, the landscape was arranged to reflect traditional perceptions: a balanced combination between wood, land, water and plants. Overall, it is an emerging rectangular structure with 127 steps, leaning against the mountain. 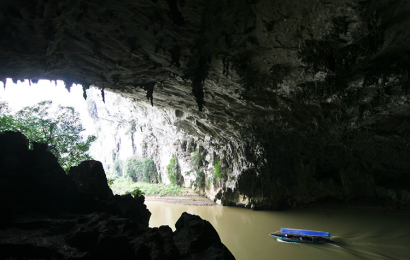 The side walls are formed by the biggest sculptures of dragons in all over Vietnam. 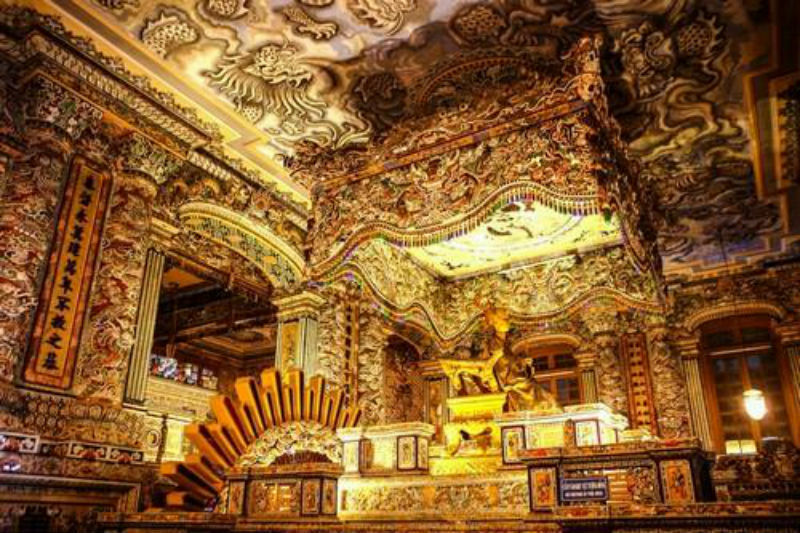 After climbing upstairs, tourists can first see the house of epitaph. The statues of madarines court (including madarines, horses, soldiers…) are placed at the courtyard. All tourist sites in here are opened all year long. Entrance fee is even free on big holidays such as the first of Lunar New Year and National Day (September 2nd). Khai Dinh Tomb opens from 7.30AM to 5.00AM.